The 18th-seeded ’06-’07 Anaheim Ducks got off to a hot start in the series, taking Game 1 by a score of 5-1 with five different goal scorers. The 34th-seeded ’10-’11 Nashville Predators took Game 2 and then the two teams split Game’s 3 and 4 in Nashville. The Predators took Game 4 thanks to an overtime goal from veteran Mike Fisher. The Predators then took Game 5 in Anaheim with three goals in the second period to win 3-1. On the verge of elimination, the Ducks took Game 6 on the road by a score of 4-2. In Game 7, Teemu Selanne put the Ducks in front early in the third, but a shorthanded goal from Sergei Kostitsyn sent the game into overtime. 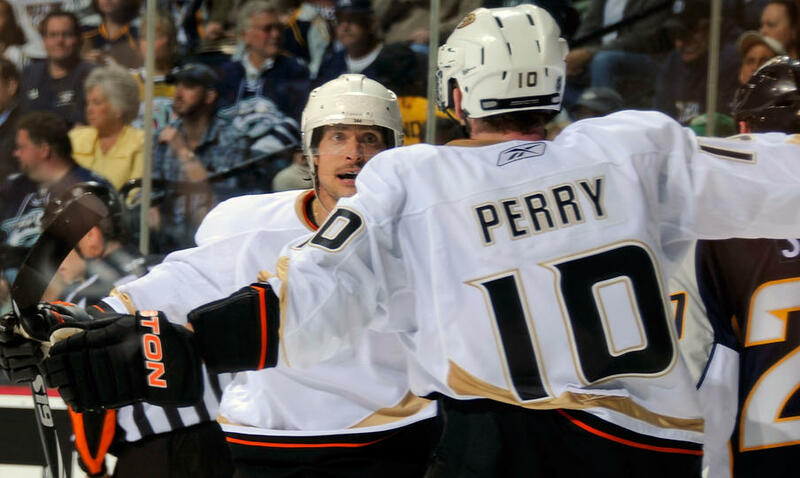 Winger Corey Perry then ended the series early into overtime with an assist by captain Scott Niedermayer. Future Hall of Famers Selanne and Niedermayer led the Ducks offensively against the Preds. Both notched eight points with Teemu registering four goals and four assists and Scotty registering three goals and five assists. Forwards Andy McDonald, Chris Kunitz and the aforementioned Perry all posted six points. Current Ducks captain Ryan Getzlaf didn’t notch much offense, but he did score the team’s eventual game-winner in the third period of Game 4. Goaltender Jean-Sebastien Giguere continued his stellar tournament. He posted a 2.14 goals against average and a .938 save percentage in the seven games. Giguere posted 40+ save performances twice in this series, a 43-save performance in the Ducks’ 3-1 win in Game 3 and a 41-save performance in a 3-2 Ducks loss in Game 4. Much like the Predators entire history, they were lead offensively by defenseman Shea Weber in this series. Weber posted one goal and five assists for six points. Sergei Kostitsyn also posted six points from his three goals and three assists. Behind those two was Martin Erat who posted one goal and four assists for five points. The Preds defensive core is usually lead by the aforementioned Weber and Ryan Suter, which Weber has done, but that is not the case for Suter. Now that the Preds have been eliminated, Suter finished the tournament with only two goals and one assist for three points and a team-low -6 plus/minus rating. Defenseman Kevin Klein actually finishes the tournament atop Nashville’s plus/minus standings at +11 and he was a team-best +4 in this series. In net, Pekka Rinne finished his tournament with a very solid series after a rocky start in the 1st Round. Rinne posted a 2.71 goals against average and a .917 save percentage, finishing the tournament with a 2.61 goals against average and a .915 save percentage. So, the 18th-seeded ’06-’07 Anaheim Ducks come back from being down 3-2 to take the series in seven games over the 34th-seeded ’10-’11 Nashville Predators. The Ducks will now advance to the Quarterfinals to face the winner between the 23rd-seeded ’79-’80 Buffalo Sabres and the 39th-seeded ’78-’79 Atlanta Flames. Up next in the 3rd Round is a matchup between the 6th-seeded ’12-’13 Chicago Blackhawks and the 11th-seeded ’96-’97 New Jersey Devils. This entry was posted in 3rd Round, Ultimate NHL Playoff and tagged 3rd Round, Anaheim Ducks, Andy McDonald, Chris Kunitz, Corey Perry, Jean-Sebastien Giguere, Kevin Klein, Martin Erat, Mike Fisher, Nashville Predators, Pekka Rinne, Ryan Getzlaf, Ryan Suter, Scott Niedermayer, Sergei Kostitsyn, Shea Weber, Teemu Selanne, Ultimate NHL Playoff. Bookmark the permalink.